Virtual Mind is the project of Italian guitarist Francesco Fareri. Their debut album, Shattered Silence, is one of three digital only releases from Lion Music, a new feature for the label. Fareri, who works with 7 & 8 string guitar, wrote both lyrics and arrangements for the songs. He's supported by a fine cast which includes singer Titta Tani (ex DGM, ex Astra, Ashent), drummer Dario Ciccioni (Twinspirits, Empyrios, Empty Tremor, Khymera etc), and bassist Emanuele Calvelli (Noumeno). So then you have another edge added: all this modern thrash/groove/prog metal is platform for a guitar style that is traditional and, for some, nearly passe in this current age. Go figure. Even with this said, with the third track, Fears, Virtual Mind turns on another motif: more the blend of traditional prog metal with smaller amounts of modern nuance. Fears gets rambunctious with the thrash thing, and even adds some near 'core' or death vocals, but it's also more melodic and accessible. This song leads to the meat, and better part, of Shattered Silence. The End of the Illusion and The Door may echo better with prog fans who like innovation but mixed with more melodic heavy and power metal. In a word: more classic progressive metal. Yet, in parts, VM still offers some of that punishing harshness. The album rounds out with the instrumental After Thy Soul and A Perfect Union. The former offers an even greater canvas for Fareri's guitar chops. The latter returns once more to more classic prog, and offers, probably, the best arrangement and exciting musicianship. It's heavy and forceful, but harshly pummeling like the early material. One thing that stymied me early was Titta Tani's vocal performance. He's a great singer, but most times it seem like he didn't know how to sing in context or simply had trouble keeping up. It made wonder if Virtual Mind's progressive metal is the best context for his talent. If you go by the first two or three tunes on Shattered Silence, you might easily pass on this album. I almost did. But the latter two-thirds of the album are worth the listen for some interesting progressive metal. It's a mixed bag for both lovers of traditional prog metal and those who like things more heavy and extreme. Shattered Silence is a good start for Virtual Mind, but I'd like to hear more to be moved from cautious ambivalence to assured acceptance. 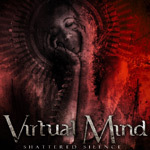 For modern progressive metal, Shattered Silence is a good start for Virtual Mind, but I'd like to hear more to be moved from cautious ambivalence to assured acceptance.